Joe McGinniss is like a marine biologist who says all he wants to do is observe the great white shark in its natural habitat. Joe the biologist made one fatal mistake, however: he got too close. He got in the personal space of the shark, and it attacked him, not surprisingly. I don’t blame Joe, although he should have known better. 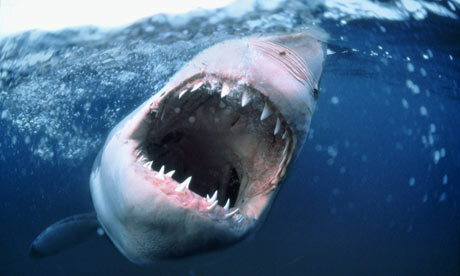 The great white is known for its aggressive behavior. It has shown in the past to be extremely reactionary, paranoid, and hyper-vigilant, especially in its home waters. Joe should have known this, as a shark expert, and should have given it a wide berth. Nor do I blame the shark. It is in its nature to react in an extreme manner- to attack when provoked. So, now what does Joe do? Does he get out of the water to stop the attack? Does he stay and subject himself to more and more rancor and hatred? Does he let the shark’s fish friends continue to pick at him, little by little, just to expose their behavior to the light? Or does he swim away to fight another day? Time can only tell, but one thing is for sure: we now know a little bit more about the great white than we did before, and it paints a very unflattering picture of the true nature of the beast.